A mass that will make you want to put on your dancing shoes? 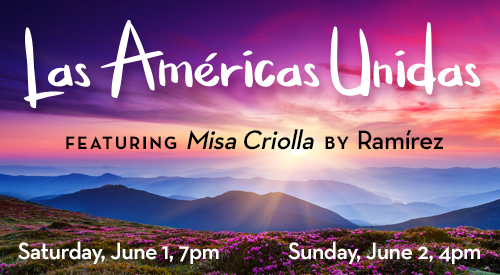 Come hear for yourself, as we finish our season with the Misa Criolla by Ariel Ramírez, a composition praised for its color and rhythmic energy, and its connection to the culture, language, and music of Argentina. We revisit our season's theme with three Nocturnes by Morten Lauridsen, set to poems by Rainer Maria Rilke, Pablo Neruda, and James Agee. Finally, Kirke Mechem's Las Americas Unidas which contains both Spanish and English texts echoing each other; a sweeping tribute to cross-cultural understanding and cooperation.